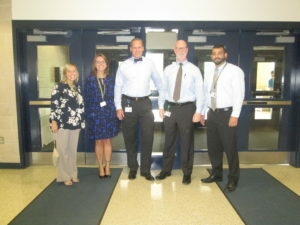 Penn Manor High School is switching it up and trying something new this year. For the first time, the assistant principals will switch positions in managing the ninth through 12th grades. The idea is to “loop” them together, so the assistant principals will follow their classes up to the next grade. Every two years students will have a different principal. Assistant principals Ms. Dorina O’Connor (ninth grade) and Mrs. Kimberly Marsh (10th grade) will switch between ninth and 10th grade every year. Assistant principals Dr. Jason D’Amico (11th grade) and Mr. Doug Eby (12th grade) will switch between 11th and 12th grade every year. The principals know transitioning can be hard, and they hope this will make it easier. The goal of this new “looping” idea is for the students, their families and the principals to connect and develop relationships while students transition into their grades. Dr. Gale said that this new policy will stay for at least two years, so they can see how it goes. “I hope it will stay. It’s a nice idea,” Ms. O’Connor said. Students won’t experience a different principal each year, only every two years so that the principals can connect with the students better. “Anytime you do what you think is best for students and families, you can’t go wrong,” said Dr. D’Amico.